Let be honest: before reading this article, you were confident that there are only 3 Gili Islands in the world and they are all in West Lombok Regency. Well, that’s not really true. Overall, there are 30+ Gilis out there (some say 33, some even claim 35) and they are scattered all over the place. Our focus today will be on Gili Bidara, a pretty small island located in East Lombok. That area is not nearly as popular among the tourists as the rest of Lombok. However, as always with Indonesia, the less known spots are usually quite amazing and deserve a visit. When traveling to a place like that, you gotta know exactly what you’re looking to find there. Gili Bidara is not a big, noisy and crowded party island with tons of cafes, hotels, and everything else in between. It’s safe to say that the foreigners will have to rely solely on themselves for entertainment. There aren’t any public facilities; yet, during the high season, you will find some food stalls here and there. In many ways, this is a deserted island, and for many, that’s a good enough reason to put it on the list of must-see landmarks in Lombok and Indonesia as a whole. It’s not a secret that a lot of wealthy and experienced visitors only pick the “uncharted” islands for their trips. Ok, without further ado, let’s dig a bit deeper and see what we can see and do there. What Is Gili Bidara All About? So, the exact address is Labuhan Pandan, Sambelia, East Lombok Regency, and, as you can see on the map, it’s pretty tiny compared to Sulat, Panjang, and Belang (they’re all located in the same area). Gili Kondo, Kapal, Pasir and Petagan are its closest neighbors. It won’t take you more than 10 minutes to travel between them. Once you rent a boat from the local fishermen, it will be at your disposal 24/7 (depends on the deal you make, of course), giving you a chance to travel from Gili Bidara to any other island and start fresh, as a friend of mine likes to say. To give you some perspective, let me tell a bit more about these Gilis and what they’re good for. Pasir is covered in white sand and will be good for that beach experience. It’s one of the tiniest islands in the world if you can believe that. Kondo is perfect for camping with a big, loving family and creating an intimate atmosphere. Gili Petagan is covered in a mangrove forest and is definitely among the most interesting landmarks in Lombok. Don’t worry: even though most of these spots aren’t that popular, the government is still keeping an eye on them, and, say, the bridges in Petagan are all in good conditions. And finally, Gili Bidara is the king and queen of snorkeling. Yes, the underwater life near this island is truly amazing and will take your breath away. The only downside: there is no snorkeling equipment in the vicinity. To get it, the visitors will have to rent it from the renting spots in East Lombok. It’s not that it will a problem to find people that are ready to rent that equipment; it’s just that it would’ve been nice to find it waiting for you on sight. 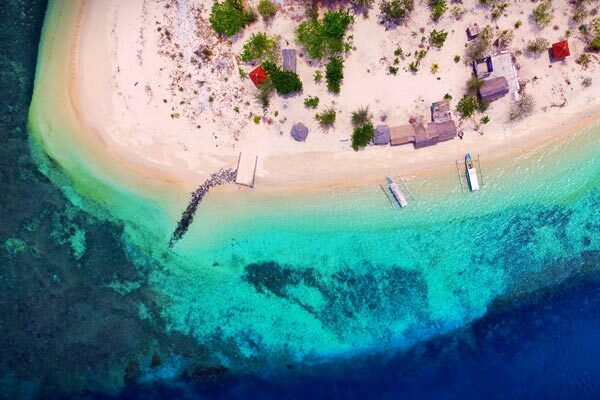 The greatest thing about Gili Bidara is the fact that even the newbies will get to experience the beauty of the corals, the fish, and the crystal-clear sea. All the “good stuff” is pretty high up and won’t require the tourists to go too deep. Actually, it was the first time I snorkeled and I managed to make several beautiful pictures of the underwater life right next to this Gili. As a “virgin” island, Gili Bidara is a very attractive piece of land for the fish. Once the Lombok officials decide to turn it into a big tourist magnet, all that attention will scare the sea beasts away. The waves are always calm, which means the surfers won’t be able to show their skills here. At the same time, the fans of diving and swimming will find the water to be incredibly inviting. It might be a bit cold during the low season but still comfortable for a quick dive. Kids with families will love every minute of their time in Gili Bidara, as the little ones will be able to play on the beach, enjoy the healing water, and still stay close to their parents. Usually, when people travel to faraway places like this one, they just want to sit near the beach and get a tan. The calming, serene scenery is perfect for letting your mind rest and enjoying the comfy climate. You can do all that on this island. Furthermore, it’s also great for several water activities (mentioned earlier) and will be a perfect “hideout” to escape the rest of the world and be left alone with your own thoughts. The fact that there aren’t any public facilities in Gili Bidara means that it’s not particularly popular and will probably be empty when you arrive there. Make sure to have a bag with the essentials on your back all the time. It should come with some snacks/drinks, a couple of towels, something to protect your skin from the sun and a camera to make some selfies – that’s it. The only way to get to this island is by using a boat. I said earlier that the locals will be happy to give it to the tourists for a certain price or take them on a tour. As a general rule, whenever there’s a group traveling to one of the Gilis, the boat owners provide some nice discounts. For the best photographs, wait for the sun to come up. They say that when everything is right, the legendary Mount Rinjani can be seen on the other side on Lombok. If you manage to capture it in your pictures, that will be awesome! Gili Bidara is a deserted island – in the best way possible. There isn’t any trash lying around and you won’t find any buildings there, which, again, adds to the amazing atmosphere of being all alone on an island in the middle of nowhere. Still, the waves constantly bring plastic bags and other trash from all four corners; so, you might see some of that on your trip. The beach is lovely; the crystal-clear water is very inviting. If you want all of Gili Bidara to yourself, don’t visit during the weekend, as that’s when you’ll see many locals and foreigners there. Sumbawa, Lombok’s “sibling”, is located even further east. For a big journey, it might be a good idea to use that boat to get there. However, it’s pretty far and you might be better off enjoying the Gilis. If I was to talk about Gili Bidara in hashtags, I’d use words like #snorkeling, #selfies, #tropical islands# and #romantic getaway. That’s pretty much all this place is about. Camp out with your buddies, enjoy the turquoise water, walk around the beach with your partner and have something to eat when the sun goes down and the moon appears in the sky. Information for the cooks: make sure you’ve got enough water as there’s no cooking without it. Furthermore, this is one of the hottest spots in Lombok; drink as much water as you can to stay hydrated. This heavenly island is located far from the capital, the airport, and the most popular beaches. Still, thanks to the fact that Lombok is pretty tiny, it won’t take you a long time to get there. The tourists that don’t have any time for sightseeing and want to get straight to Gili Bidara should head straight to the north-eastern beaches as soon as they land at the airport. The entire trip will be over in about 2 hours. From Kuta, one of the biggest tourist magnets in Lombok, the road will take 2 hours and 30 minutes. Mataram is located in West Lombok Regency and offers two routes. The first one lies along the western coastline; you need to take it if you’re in Senggigi. The second route lies through Central Lombok Regency. Which one is better? It actually depends on your current goal. For me, the western route is the best one. On the other hand, people that are in a hurry and want to save 30/45 minutes should pick the route through the center of the island. Ok, that is pretty much everything I wanted to share with your guys today. I hope this article about Gili Bidara was equally informative and exciting. Not the first Gili I've been to, but it certainly does have a heavenly touch to it. Lombok is a cheap island, but the prices go up during the high season - keep that in mind. It's not really that big and can get overcrowded fast. I totally agree that the weekends are the worst. Along with Kapal and Kondo, this is an intimate island that is best to be experienced on your own. Another decent Gili Island I've been too. It's not unique but still pretty damn fine.